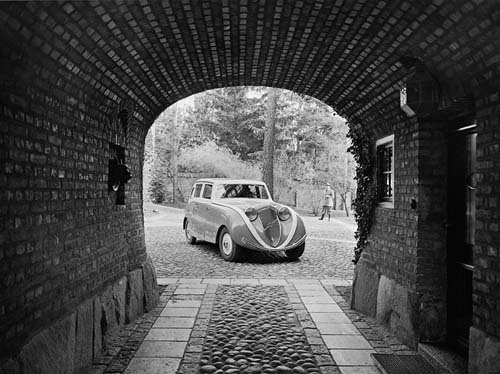 These wonderfull photos of the 1933 Volvo Venus Bilo were made in the garden of Villa Roskull on Lidingö, near Stockholm. Like a mighty Vasaborg lies the splendid Villa Roskull on top of the Högudden with a great view over the Stockholm inlet. The villa was built in 1912, commissioned by the engineer Gustaf LM Ericsson, who was the son of the famous Lars Magnus, LM Ericsson. Gustaf Ericsson lived between 1880 and 1965. 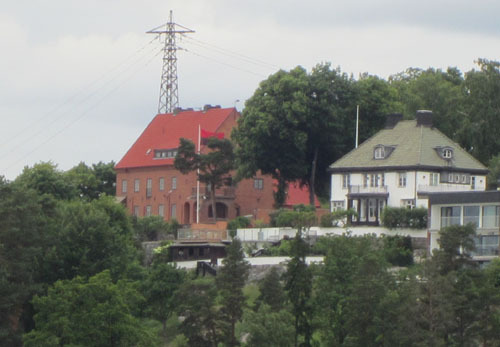 On Lidingö, near Stockholm in the Brevik and Högberga area, a number of villas where built in National Romantic style, which now has considerable cultural value. Among them are Villa Högudden and Fåhraeuska villa. It took place in the years 1909-11, according to plans by one of the national romanticism foremost architect, Carl Westman. Villa Ericsson or Villa Roskull as it later was to be called, was designed by the renowned architects Sigurd Lewerentz and Torsten Stubelius. 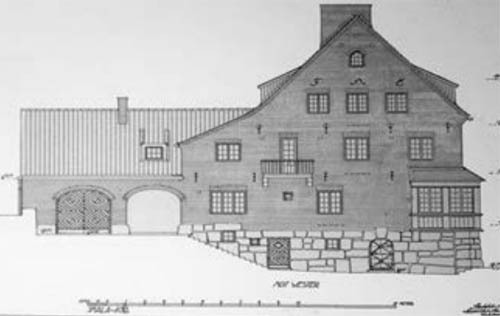 Lewerentz was a former employee of Carl Westman and worked with him including the drawing of Villa Högberga. Lewerentz was educated initially in engineering in Gothenburg and studied later on to an architect in Germany. In Stockholm Lewerentz started his own architectural firm in 1911. Villa Roskull was one of his first buildings own behalf and had some of the National Romantic features as seen on Villa Högberga. Roskull is built with façades of dark red bricks, a roof of single shaped clay tiles and dark-painted window frames. Rooflines are very small and the villa has richly ornamented door scopes and beautifully cut timber doors. Drawing brick buildings Lewerentz had learned from Westman during his years in Germany. This villa is the only one of Lewerentz work related to national romanticism! 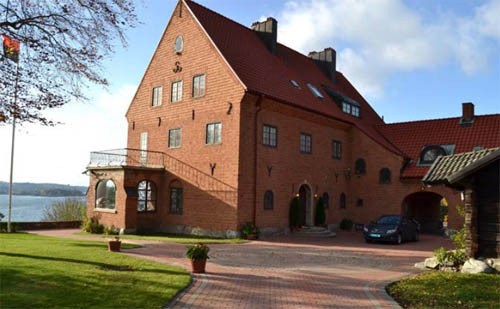 Impressive building Villa Roskull is a mighty brick building erected in two floors, basement and attic. Housing bit closed nature opens out onto the fairway with a several windows facade. On the eastern façade Gustaf Ericsson monogram is inlaid in the forging, as well as the construction year 19 12. The magnificent interior decor is partially inspired by the English Castle buildings with vaulted ceilings beaten, including the magnificent entrance hall. On the ground floor there are several large rooms for conviviality, for example,a magnificent hall in Baroque style. The large kitchen housed cooks and other service staff. Upstairs there are areas of a more private nature with several bedrooms and bathrooms. The house is surrounded by a beautiful, park-like garden which creates close contact with the outside surrounding archipelago landscape.The view towards Stockholm is breathtaking. The brick wall surrouned garden has clear national romantic traits with elements of a natural garden, lawns, terraces and stairs. In the early 1900s it was not uncommon for wealthy art collector and financiers to have built large homes for themselves. 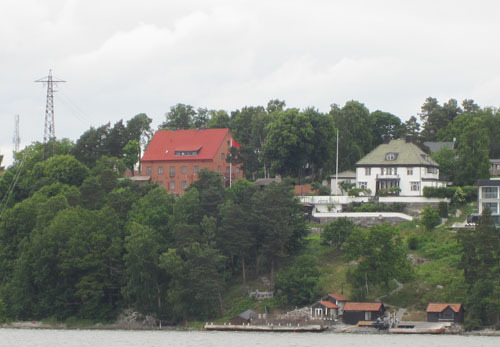 Several examples are still on Lidingö, such as Klas Fåhraeus Villa Högberga and Wilhelmina Skogh Villa Foresta. Although Villa Ekbacken, Gustaf Dalen private villa by the AGA and Paul Urban Bergström (PUB) Villa Paulsro at Bosön belongs to the group of monumental private villas built on Lidingo in the early 1900s. 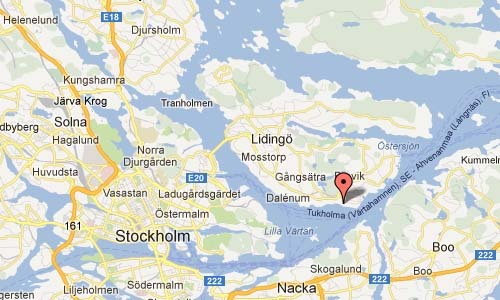 Villa Roskull is another example, with location facing south at the top Lidingö southernmost tip, Högudden. Location was chosen carefully to give the best possible view of the water inlet to Stockholm. paraphrase the famous statue of Venus de Milo. The car was built as a covered sedan and was one of the first cars with a distinctive streamlined shape. The cars had previously been boxy and angular. In order to reduce turbulence and air resistance was now the body of the Volvo Venus Bilo completely streamlined, to the bottom was smooth. Another example of innovation in automotive design was the storage of the spare tire. It had on earlier models were mounted standing on one of the car’s flanks or rear. Now it was a new place in the rear of the car, kept in a horizontal slot in the bumper and then worked as a shock absorber! Venus Bilo was nearly five meters long and held six passengers and nine custom-made suitcases. The car was painted in the Swedish colors, blue and yellow. 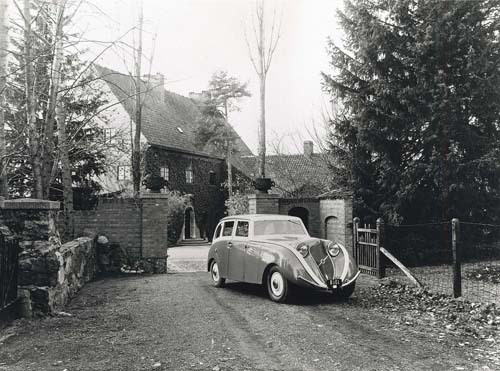 Here is seen the car photographed outside Villa Roskull. From the beginning the building was named Villa Ericsson in honour of the owner. 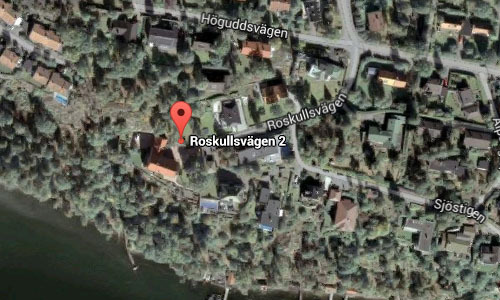 Later it changed into Villa Roskull. Where the name comes from, however, is shrouded in mystery. One interpretation is that it is derived from the swedish expression ‘för ro skull’ which means ‘for nothing’. 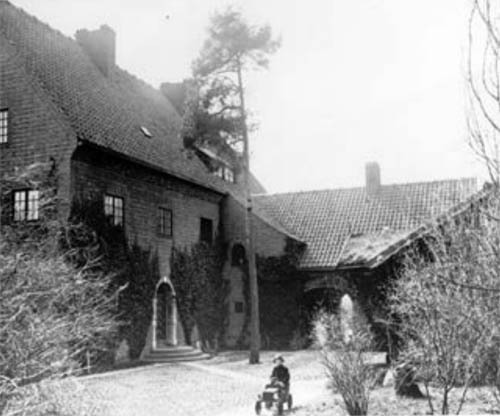 Gustaf Ericsson owned Villa Roskull until 1945 when it was acquired by Georg and Marie Trolle. From 1951 the villa was owned by Marianne Tower Havelock and 1979 by Matts Carlgren. Since 1986, the Angolan government are the owners and it is the house represent the Angolan Embassy in Sweden. 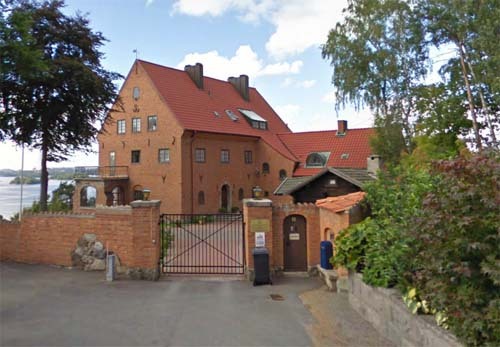 Lidingö Hembygdsförening applied to the County Board to get the villa declared a historic building, but the application was rejected in 2001 by reference to a direct threat to the survival of the building did not exist, and that the building was owned by a foreign state. Villa Roskull is recorded by the Stockholm County Museum as “a historically indispensable building. It is located in Brevik – Högberga area constitutes a cultural history valuable whole environment.” At a distance, one can now consider the beautiful condominium building that is very well maintained. But come a little closer talking walls, fences and surveillance cameras themselves. Text by Johan Ahlbom for Nya Meddelanden från Högberga-Breviks villaägareförening. Våren 2015. Årgång 52. Nr 95 från starten. Many historians mistakenly call the 1938 Buick Y-Job the world’s first concept car. In reality, the honor goes to the Volvo Venus Bilo, a highly aerodynamic family sedan that was presented to the public five years before the Y-Job. 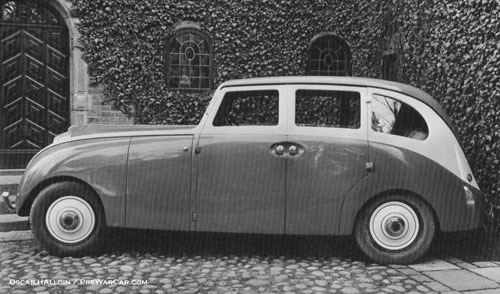 In the early 1930s, young Volvo wanted to test the public’s reaction to an aerodynamic car but it was reluctant to associate its name with the prototype in case it was poorly received. As a result, the project was handed to Gustaf L-M Ericsson, a well-known engineer who was part of the Royal Swedish Automobile Club. Ericsson was the perfect man for the job because he had been toying around with the idea of an aerodynamic car for over a year. Swedish coachbuilder Nordbergs Karosserifabrik was tasked with building the prototype. The firm started with a bare PV655 chassis and moved the straight-six engine forward in order to accommodate a vast storage compartment right beneath the windshield. The left side of it was used to haul luggage while the right side was designed to carry a spare tire, a jack, tools and a fuel can. The Venus Bilo’s body panels were designed to be cheap to manufacture and easy to replace. To reduce dust, a big problem on period Swedish dirt roads, the car’s underbody was entirely smooth save for a set of small slots designed to release the heat generated by the engine. Visually, the car featured a full-width body, headlights that were largely integrated into the bodywork, a tall and heavily-curved grille and a front bumper that curved upwards. The back end was upright and rounded, and the rear bumper was replaced by a second spare tire that stuck out from a horizontal slot. There was no trunk lid, but the passengers benefited from a second storage compartment behind the rear seats. 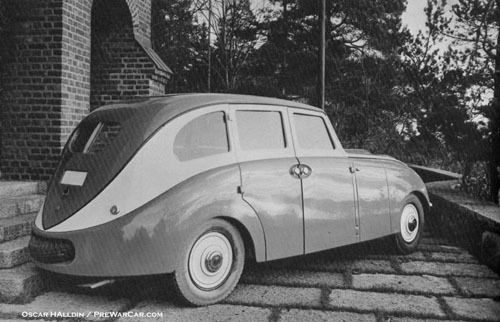 The Venus Bilo made its first public appearance in November of 1933 at an event held at Ericsson’s luxurious mansion on an island located outside of Stockholm, Sweden, called Lidingö. 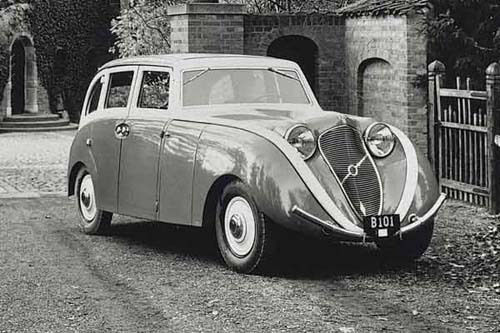 While many guests were impressed with the car and liked the idea of an aerodynamic body, the public generally thought the Venus Bilo was hideous and Volvo quickly stopped the project in its tracks. 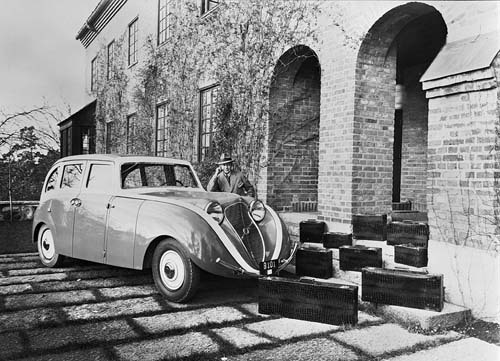 Following its debut at Ericsson’s house, the Venus Bilo was displayed in the showrooms of major Volvo dealers in Sweden and, later, in Copenhagen, Denmark. Upon returning to Sweden it was briefly driven by Ericsson himself before going through a series of different owners over the course of the 1930s. Its precise path is not known, but the car ended up in the hands of a scrapyard owner in the Danish countryside who converted it into a pickup truck and used it as a work vehicle. It was last seen in the middle of the 1950s and it is believed to have been destroyed shortly after. 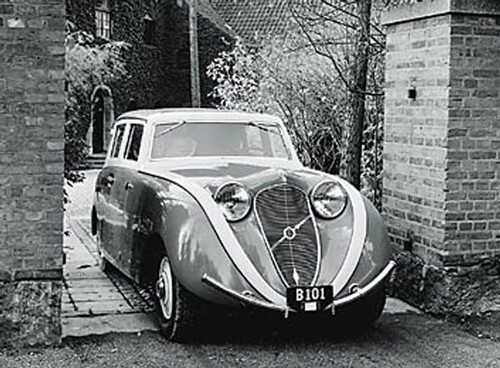 Designer Ivan Örnberg integrated some of the Venus Bilo’s aerodynamic styling cues – including the flush headlights – into the PV36 Carioca that was launched across Sweden in 1935. The 36 was an even middle ground between the aging 650-Series and the futuristic Bilo, but it was not particularly successful and production ended just three years later. It was replaced by the PV51, which reverted back to a more classic style that featured headlamps that popped up from the front fenders. So for those who can search the junkyards and straw fields of Scandinavia, the Venus Bilo may be the ultimate barn find waiting to be discovered. 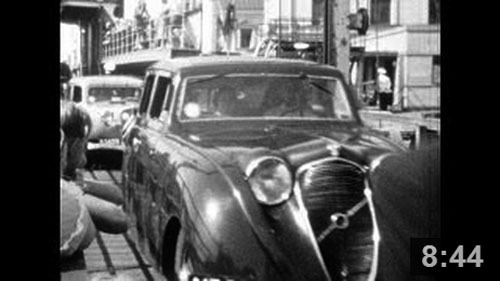 UPDATE 1: A film from 1949 has been discovered showing the Volvo Venus Bilo leaving the ferry from Denmark. Have a look at the Youtube video from 07:27 minutes. A decicated video will hopefully be coming later. 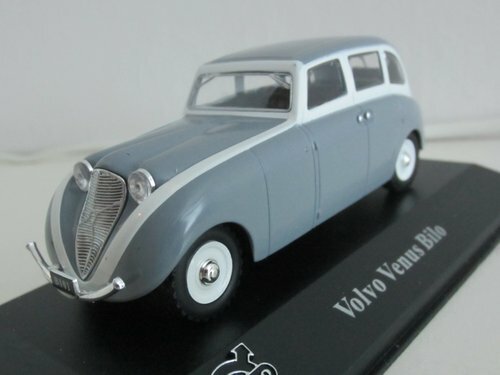 UPDATE 2: Edition Atlas offers from September 2015 a 1:43 scale modell of the Volvo Venus Bilo in their Volvo Collection. See all my models in the Volvo Collection here. Very little is known what the original color was of the Venus Bilo, some sources say that it was painted in the Swedish colors, blue and yellow. I have no information found that refers to other colors. 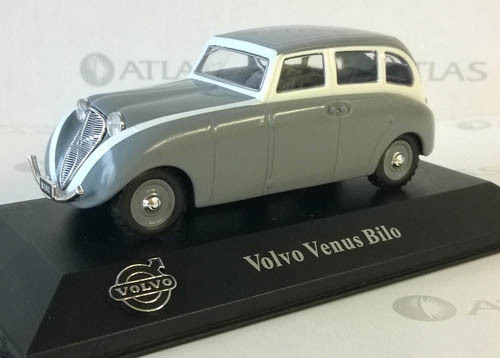 2015 – Volvo Venus Bilo by Edition Atlas in the Volvo Collection 1/43 scale. Nice car. I have not found the Volvo Venus Bilo yet but I have found a picture and film! 16 years old Venus Bilo rolling of the ferry from Denmark to Sweden in -49. I show a little of that in my youtube-clip. That might be interesting for all fans of the Volvo Venus Bilo. As soon as the film footage is availbale online, I will share it also here. Great that you made the film and website! I’ll update the page with information soon!